We are a unique name in the market to provide our respected customers an exclusive range of Tower Number Plate. The VingCard Room Number Plate is available in the same style and finish as the VingCard card lock ensuring uniform appearance on guestroom doors. 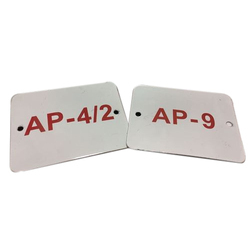 The plates can also be enlarged to use on other doors, such as “Private, “Conference Room, “Swimming Pool etc., and as indication for corridors, i.e. “201-229″. Our Room Number Plates can be customized to suit any environment. Using premium quality Brass Name Plate for their innovative designs. We can design specially as per the orders received by our valued clients. We are a leading trader wide range of Orbiz Car Long Number Plates. Automatic Number Plate Recognition System is the solution for the security department. It helps to monitor, track and view the details a vehicle moving through a lane, standing in the parking area. It helps to monitor offences done by using the vehicles. As we also maintain the database of all these cars, we can also track any suspected vehicle.